Rush's live package Time Machine 2011: Live In Cleveland is to be released on vinyl later this year. It previously appeared on CD, DVD and Blu-ray, and will now launch on 4LP featuring all 26 tracks on June 7. 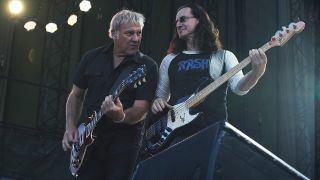 The concert was recorded and filmed before Geddy Lee, Alex Lifeson and Neil Peart returned to the studio to record their 19th and final album Clockwork Angels. The Time Machine Tour not only featured classic tracks including Spirit Of Radio, which kicked off the shows, but also saw the trio playing their classic 1981 album Moving Pictures in full. Time Machine 2011: Live In Cleveland is currently available to pre-order through Rush’s Backstage Club. Last month it was announced that the band would celebrate their live performances in the new book Rush: Wandering The Face Of The Earth - The Official Touring History. The 416-page publication has been compiled by Skip Daly and Eric Hansen. It’s been fully endorsed by Rush, and will include every setlist, feature previously unpublished photographs and document all the bands who joined Rush on the epic career.